Learn the Ninjutsu "the art of the Ninja"
that is no longer taught in Japan anymore. IN THIS COMPREHENSIVE NINJUTSU COURSE ARE HUNDREDS OF TECHNIQUES! Body Conditioning – Chokes – Spiritual Refinement and Much, Much More!! This is the #1 Course for learning Ninjutsu. Let me ask you this. What is the most important thing in a fight? Some would say winning. I say Not getting hit! I would say that staying as safe as possible while not getting injured and our ability protecting others while not looking like a fool is much more important. We all want to win and no one wants to loose. Proper defense strategy, awareness, confidence, and skill set are all important. Ninjutsu adds hidden secret methods that other arts do not - we love to do the unseen and unexpected. In fact we pride ourselves on that. Not only is it fun, IT WORKS! So in this super proven (since 1992) Ninjutsu BlackBelt Course we start of with building your awareness so that you have the right mind set so you know the proper defensive strategies so you develop the confidence and know how to Ninja your attacker. We teach you the art of distancing and how not to get hit. We teach you how to do easy 1-2-3 counters to take your opponent down into submission fast. We teach you how to condition your body, no matter what shape you are now in. Then level by level, technique by technique we step it up so that in a short time you are handling yourself in a fight with confidence and you are learning cool exotic weapons in the process. One day you will be handling multiple attackers that have weapons. Our training is fun and realistic. Be a part of anicent traditions and grow with it into the future. BTW, We have training available for you all the way up to Master levels (See the Ninjutsu Masters Course) and IBDA is worldwide since the mid 1980's. It is a complete system that you can trust to be there for you and your children or students. We also have a complete Shidoshi Teachers Training. So get started on your journey as it will be an exciting and rewarding one. All the techniques from Beginner 9th Kyu to Shodan (1st Degree BlackBelt) are written out step-by-step and include detailed how to pictures of the techniques presented on the dvds. This is a great asset to help you learn the Ninja art. 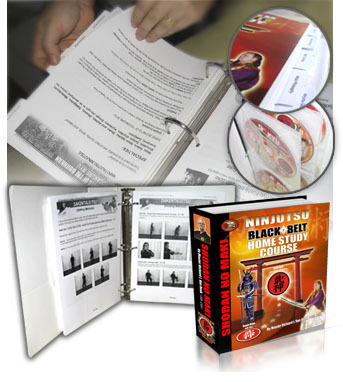 Plus everything is in a special designed binder which also holds your study dvds so that you can take the Ninjutsu Course with you anywhere, making it a true Distance Learning Ninjutsu Home Study Course. At this point in your training your attention should be on your partner's body and the effects that your movement and technique have on your partner. This dvd reviews the importance of this as well as introducing the sword, including how to hold it, 10 different sword kamae (postures) and the basic movements and cuts from each of the 10 postures. Advanced Taisabaki (body evasion) is covered on this tape, paying specific attention to distancing & timing, as well as advanced Ganseki Nage (throwing forms), power moves & damaging blows to crush your opponent. Sword postures (10 different kamae) , basic movement and cutting from each one, Throwing skills of ganseki forms, Silent movement, using nature, Fist and body harmony, power moves, damaging blows crush your opponent. 3 BONUS ITEMS - FREE!! YOU CANNOT BUY THIS MANUAL FROM US UNLESS YOU ARE TAKING THIS COURSE OR TRAINING IN A CERTIFIED IBDA DOJO. 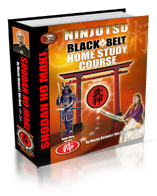 You can get the basic Shodan Manual from us BUT not this upgraded one designed for this Home Study Program. The Comprehensive and progressive training Dvds are great training tool but a step-by-step Ninjutsu training manual with all the required testing information, history of the art and bios main instructors, concepts of Ninjutsu training, Ninpo Philosophy, diagrams, poster pages displaying the main postures, terminology glossary, Spiritual practices and Meditations, and the 9th kyu to Shodan techniques are written out step-by-step with detailed how to pictures of each of the techniques presented on the dvds. This is a great asset to help you learn the art. Plus everything is in a special designed notebook binder that you can take it anywhere with you making it a true Ninjutsu Distance Learning Home Study Course. Japanese is a difficult language to learn and we are learning a Japanese art with lots of terminology in it's original language. This is not hard to learn if you are learning a technique at a time with a name attached to it, as you are just naming something. But being able to pronounce it right, Ah,,, I don't know about you but I need some help here. Shidoshi Linda Van Donk after hearing some rather interesting training terminology said in a very funny way (can't write it here) sat down and scripted out all the important Japanese words that we use in training up to Shodan. Then She recorded it on an Audio cd for the students (many thanks to her!). This Ninjutsu terminology Audio cd says the phase in Japanese and then in English with a slight pause so you can repeat it out loud. What a difference it makes. This normally sells for $19.95 and we threw it in the set for FREE. So Get started Right Now on your Ninjutsu journey with us! Years of training for one small investment. Just Get it Now as I cannot guarantee this Low Price of $297- will be here when you come back. I have studied Martial Arts for years, read books published by Masters and used them to practice Taekwondo and Brazilian Jujitsu and I am very satisfied with this program. The depth of the information conveyed as well as the honesty of that information being just a beginning is matched with the high level of content. I am reading the manual in sections because of the size of the material. All in all I am very pleased that I bought this program. Great course-the foundation of Bujinkan training-the starting path to becoming a Ninja-thanks again Master Von Donk!